florence. — basic & boujee. traveler note: ashley studied abroad in florence in college so this city has an extra special place in her heart. from strolling through the cobblestone streets to spending hours in the museums (ok, not hours, she was 21 and probably enjoying more wine than museums) to drinking wine at piazzale michelangelo this city is probably her favorite in all of europe. get a bottle of wine and head up to piazzale michelangelo at sunset for gorgeous views of florence and the surrounding hills. but be warned- you won’t be the only one with this idea. during the tourist season it will be crowded. stroll through the boboli gardens at the pitti palace for an escape from the city. monika iris tour: email he monika@monikairis.com for a customized tour of different wineries throughout tuscany. a must do is an olive oil tasting. ask for the olive oil tasting at villa monteoriolo to a truly italian experience. la ménagère this place has taken a new spin on the italian kitchen in a trendy environment. trattoria 13 gobbi is a classic florentine trattoria set in a cozy alley. mercato centrale has been the main food market in florence for over 140 years. Just recently they re-opened the first floor (american 2nd floor) which is now a bustling eatery full of pizza, pasta, salami, cheese and all the wine you can drink. trattoria zaza is a vibrant and classic italian restaurant in piazza mercato centrale. gusta pizza is a fun and inexpensive pizza kitchen serving up 5 euro pies. order a pizza and bottle of wine to go and then go sit on the steps of piazza santo spirito. vivoli to round out your pizza and pasta diet, get some of the best gelato here. la ménagère if you didn’t get here for dinner, be sure to stop by here for a drink either at the main bar or head downstairs after 10pm for live jazz. the rooftop at grand hotel minerva has a spectacular view of the city. irene at the hotel savoy provides an excellent people watching spot on the piazza della repubblica. san lorenzo market is a traditional italian outdoor market filled with all souvenirs you could possibly need or don’t need. la ménagère is also home to an adorable home goods section and flower shop. if you can't tell already, i love la ménagère. olive oil tasting at villa monteoriolo. 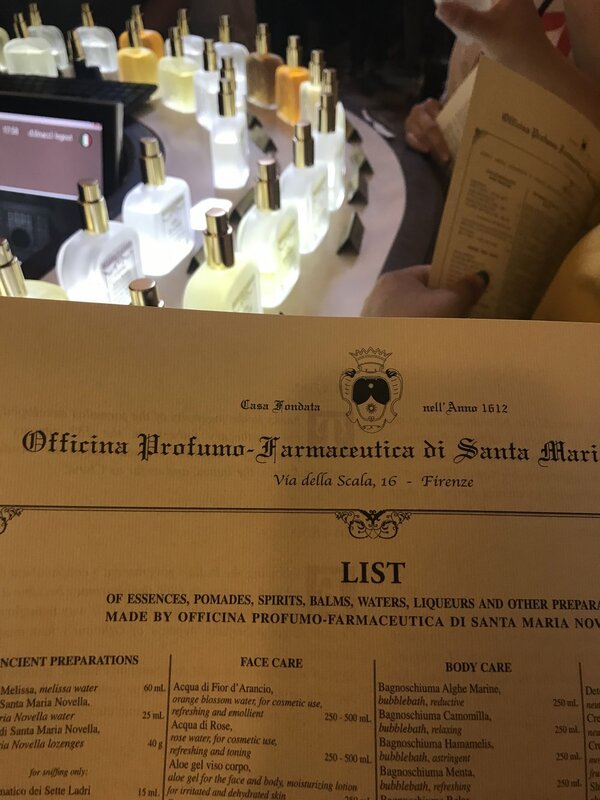 officina profumo - farmaceutica di santa maria novella.